Communication Workers of America held one of the largest retail worker strikes in US history. Cleveland DSA was there to stand in solidarity with the striking workers. 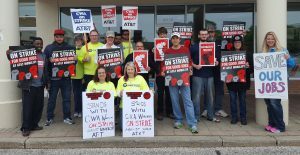 On Friday, May 19th members of CWA Local 4320 and approximately 40,000 employees of AT&T Mobility walked off the job in a 3-day strike that stretched across the country. DSA members across the country came out in support of the picket lines. Cleveland DSA members joined them on the picket lines at Independence and Avon with signs, comaraderie, and working class solidarity. Our comrades in Akron DSA were a visible presence in North Canton and helped reinforced the pickets with us in Independence. AT&T reports the strike severely hampered their weekend operations, indicating the labor action was effective. AT&T put out an overly self-congratulatory press statement claiming their union workers made “$115K – $148k per year” already. (Corporations often include the cost of benefits, such as 401K and health care contributions, to artificially inflate their reports about worker wages.) AT&T claimed they had a “substantial contingency workforce of well-trained managers and vendors in place” (aka scabs). The store we picketed at was closed tight, paper sign hastily plastered to the door, “contingents” nowhere to be found. publicly available calendars. Cleveland DSA was the only political organization at the NEO picket lines. As of 5/31, CWA and AT&T are at a stalemate, with no headway on negotiations on the other side. If CWA returns to the picket line, Cleveland DSA will be right there alongside them. [JUN 4] Street Fight Radio comes to Cleveland! [JUN 10] ABCs of Socialism: Aren’t Socialism and Feminism Sometimes in Conflict?